This is a guest post from Sister2 about her most recent marathon experience. You may know me as Sister2, or if you have been reading Eat Run Read for over 2 years (is there anyone besides my family that does?) you may know me for marathoning in unitards and spandex. Well, marathon number 3 took place last weekend and I am here to tell the story of a race going very much not according to plan. 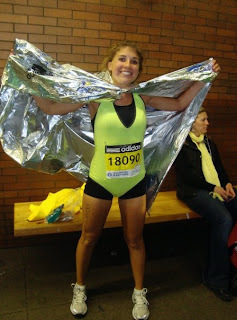 I ran Boston (as a bandit) in 2009 and had an amazing time. It was my first marathon, I wore a neon unitard, and there wasn’t any real pressure to do anything besides finish the thing. I ran 3:56 and was very happy with my first marathon experience. 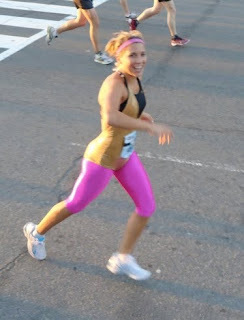 The following spring I ran the DC Suntrust Marathon (both Boston and DC were based on visiting Mollie, of course), this time wearing a gold unitard with pink spandex underneath. Although the course wasn’t too amazing (the second half went through a pretty ugly part of DC), I had another great experience and improved my time by over 25 minutes (I ran 3:30 and some odd seconds). These two experiences led me to believe that time improvement was an inevitable result of running races. OH HOW WRONG I WAS. Skip ahead to early 2012. [Editor's note: Sister2 was busy being a bad-a** mountain biker/world traveler for a while there, and so took some time off marathons.] I was originally going to run a marathon in Buena Vista, Colorado where I worked at a summer camp for 3 years, but work plans made that impossible, so I decided to run the Biz Johnson Trail Marathon in Susanville, northern California, mostly based on convenience, timing, and price. I also read great things about the course, so I signed myself up for the marathon and my boyfriend for the 10k and kept training! Training went great. I felt strong and relatively fast. I set a goal of running under 3:15 and was excited to race. I went to Tahoe a few days before the race to hang out at altitude and be closer to Susanville. Although I had some cold symptoms in the week before the race, I was feeling well and ready to go the day before. This time around I opted to wear normal clothing...I just didn't think a trail race was the place for a unitard. I was on the start line at 9:00 am with the other 200-ish runners (waaaay different than Boston) and was off. At one point I was even the first woman (which lasted about 30 seconds). Last year’s first place woman ran 3:26 so I thought it was realistic for me to try to win. First and only real problem – I was way too concerned about my time and place and not focused on truly enjoying the race. Things were going relatively well the first 6 miles – despite the 5,000 foot altitude, I was enjoy it. I’m not sure exactly when things really went south, but I know things weren’t feeling good at mile 9 and after. Overall the race was pretty bad – varying levels of pain, unhappiness, and giving up – with occasional glimpses of enjoyment. On the positive side, the course was very beautiful, the other runners were always very positive (when you are so few in numbers, you always encourage the others), but I mostly ran alone, wondering while my legs wouldn’t move faster. When I was pretty sure I was too far off my goal pace, I thought I would still go for a PR. When I realized that wasn’t happening, I hoped for a Boston qualifying time (sub 3:35). When that wasn’t going to happen, I just wanted to finish (please under 4 hours). It sounds bad, and as any runner knows, a bad race is bad, but I promise I wasn’t such a downer the entire time. There were times of gratitude for the few people cheering us on, for the people at the frequent (thank God) aid stations, for my dad going to each place he could to encourage me, for the other runners, and for my boyfriend running the last half-mile in with me. I finished the race in 3:53:07, swearing I would never run a marathon again, disappointed, and feeling like I didn’t deserve any special treatment. I knew I couldn’t just end my running “career” feeling that way, so I thought about it a lot, discussed it with some very wise people, and I now feel so grateful for this learning experience. I may not run another trail marathon (ever…or at least for a while), but I am sure I will want to run another marathon. My training wasn’t a waste – did finish a marathon and I learned something about dedication even when things aren’t going well. Above all, I was humbled exactly when I needed to be, when I was feeling overly self-centered and conceited. I am looking forward to running another marathon in the next couple years, but next time I will wear a unitard just in case that was my problem with this one!